Generating response rates over 40 percent, using text messaging for recruiting has already established itself as an effective engagement tool, with most candidate replies taking less than 30 minutes. By now, you’ve likely heard many of the reasons why text messaging should be an important part of your recruiting process, but what about the post-hire experience? The same candidate-focused text messaging principles and practices can, and should, be applied to your employees too. Southeastern Grocers, one of the largest supermarket chains in the U.S., and parent company of Winn-Dixie, BI-LO, Harveys and Fresco y Más grocery stores, needed a simple and effective way to stay connected with current employees – from the moment they receive a job offer, continuing throughout their entire employee lifecycle. With 45,000 associates staffed in retail, pharmacy and corporate roles across more than 780 stores, it was also important for Southeastern Grocers to find a solution that seamlessly integrated with its iCIMS Talent Acquisition Platform, which it has successfully used for recruitment since 2015. Integrating TextRecruit within iCIMS has revolutionized the way Southeastern Grocers communicates with both employees and candidates. As an iCIMS company, TextRecruit enables shared customers to effectively increase engagement throughout the entire hiring process through text messaging, with a seamless integration into iCIMS. Using the TextRecruit TextHR product, in conjunction with iCIMS Onboard, allows Southeastern Grocers to use text messaging to optimize essential business functions by effectively engaging employees. After Southeastern Grocers’ hiring managers send out onboarding-related emails to new hires via iCIMS, they also send text message reminders, through TextHR, to ensure that new hires stay on schedule with each required onboarding task, such as setting up direct deposit or signing a noncompete agreement. Why it works: With emails not being checked as frequently as text messages, this becomes especially critical for time-sensitive onboarding tasks, such as drug screens, where the timeframe to complete the task is very short. Text messaging and chat apps have nearly replaced email as preferred methods of modern communication. TextHR allows Southeastern Grocers to ensure that its employee data is accurate and up-to-date. Each quarter, text messages are sent to Southeastern Grocers’ employees asking them to verify and update (if needed) their personal and demographic information. Why it works: This enables Southeastern Grocers to successfully and easily maintain employee engagement for important matters, such as open-enrollment elections, paperless W-2 form submissions and insurance and benefit updates. Results: With a quick and centralized process of sending HR-related updates via text message, hiring and administrative efficiencies are increased across all locations. 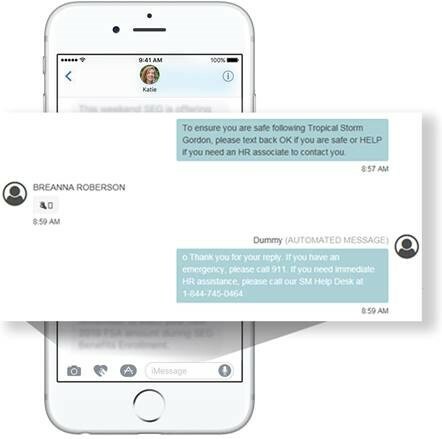 With many of its locations in areas prone to severe weather, such as Florida, Louisiana, North Carolina and South Carolina, Southeastern Grocers uses TextHR to verify employee phone numbers prior to hurricane season each year to ensure that any text messages sent out will be received in the event of a crisis. Why it works: With text messaging available on every cellular device and no mobile application needed, sending company-wide alerts about unexpected store changes and confirming of employee safety is made simple in case of an emergency. Results: Being able to easily offer support to its entire employee base allows Southeastern Grocers to further foster its compassionate company culture. “If our stores are impacted by a hurricane, we want to check on all of our associates to make sure that they are safe, that their houses are okay and offer any assistance. Without being able to verify phone numbers through iCIMS and TextRecruit before a disaster strikes, we would have a very hard time getting in touch with all 45,000 of our employees if needed,” added Schaublin. Want to learn more? Hear from Randy Schaublin in his own words as he explains how TextRecruit and iCIMS help improve hiring efficiency and speed across multiple retail locations while effectively engaging employees.